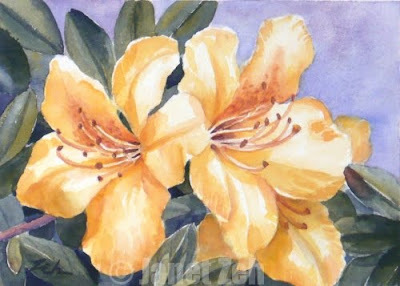 Pretty golden azaleas from a friend's garden were something I just had to paint! Azaleas are blooming spectacularly here this year considering it's New England. Even my pink and deep rose shrubs are full of blooms. Generally the cold weather is too much for them. But we had a milder winter this year. This piece is painted with the three-color palette that I've been using. I've found it works better for some subjects than others depending on the colors one wants to use. The yellow azaleas with a soft blue background are perfect for it! Check my Etsy shop for Azalea paintings or prints.